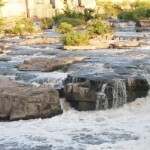 Sioux Falls, South Dakota is founded upon deep grooves formed formed nearly 14,000 years ago by passing glaciers. These grooves carry the waters of the Big Sioux River across a wide, magnificent set of waterfalls. The seemingly endless flowing falls are absolutely beautiful. Enough words, check out the the pictures.